It was on one of those rainy and windy mornings that we have been having lately that I first saw Dioscoro Hervias. He rode past me going the opposite direction. I immediately thought he looked out of place in the Peace Arch City and was more like a character in a Walt Disney movie. 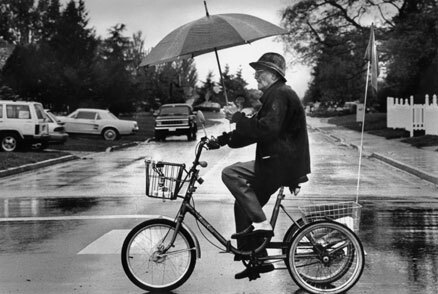 This 85 year old sojourner was on his way to the Rite-Aid pharmacy to pick up a needed prescription. Dioscoro is a native Filipino and is used to the rain and carrying umbrellas so this trip wasn't particularly difficult even with one hand on the handlebar and the other on the blowing umbrella. Dioscoro came to The Peace Arch City with moves from Tacoma and Sumas after he immigrated to the United States in 1992. During World War II he was inducted into the military and helped the United States battle the Japanese on his homeland. This father of eleven children became a high school architectural/drafting teacher. Now, he is pleased that four of his children have moved to Vancouver, BC to be near him and his wife. One of his favorite culinary delights is pizza but he loves traditional rice dishes too. Dioscoro says, "he was born a Catholic and will die one too."